Yesterday was a vacation day for me. I got to spend that day with 3 or my favorite people. 3 people who have influenced, helped and served me tirelessly over the years, and 3 people I pray I have been of some blessing to as well. My mom, my mother-in-law and my sister. So what did we do with this vacation day you ask? In Ohio when you want to get-away, you go to Amish Country! Ha, ha! However, vacation and laid-back, relaxing, not a care in the world...these just never seem to describe my vacations. We left a full hour later than planned due to a variety of unplanned stops that had to be made and various other interruptions. When arriving in Berlin we had no idea the whole strip was under construction making it probably the worst Ohio location we could have chosen to go to - from a Senior walking perspective. Sidewalk removed, only gravel to walk on down one side of the main strip, and ditches that required jumping in order to gain access to the shops - all of these unforeseen details pretty much exhausted the mom's after just visiting a few shops. 95 degrees in the sun. When you have one Senior who struggles to walk already - this caused us to pause every few steps for resting...in the hot sun which just made us more exhausted. All that to say - my fantasy of a glorious 'day out' took on an entirely different look then envisioned. As is the case at least once a week, "I don't know how people face any day without the Lord", we laid our late start and frustrations aside as we saw what the Lord had intended. We took all back-roads and the back-seat comments made every effort of ours worthwhile as my sister and I heard things like, "I haven't seen a corn crib like that since I was a child..., look at those beautiful hills..., the flowers are just magnificent...I remember when dad would come home from working all day and then we'd all head to the farm to help grandpa farm all evening". My mom's recent loneliness, from the loss of my dad and her struggles physically, and my mother-in-law losing her ability to drive make me look at the Senior population in a totally different way. I admire other countries far beyond our selfish American practices as I see them love, care and most of all RESPECT their seniors far more than we do. In cases of medical need and to protect their safety I totally am thankful for care facilities that our amazing country has for our seniors. But, when they're still functioning and just unable to drive or to be an active part of the community around them - my heart aches for them. And, I hope I can be of some help in communicating to all the Seniors in my life how much they still have to offer us. 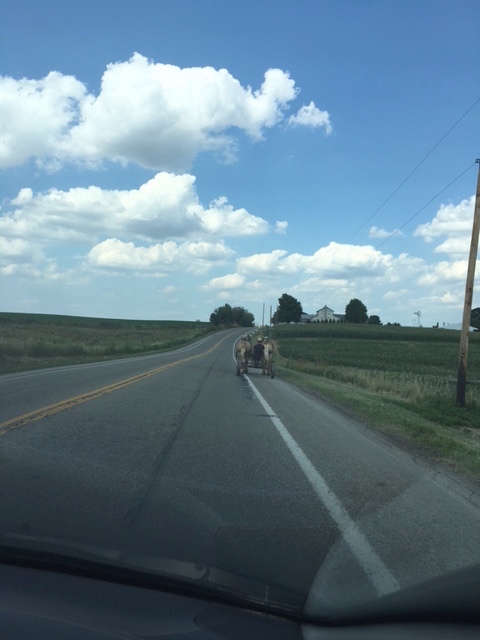 As our day came to a close in Amish country yesterday, the precious comments, the simple pleasure they took away from just 'going somewhere' will be long remembered. And maybe next time, I'll remember to ask if the place we are going at least has a sidewalk.